This can be used as a follow-on from Two on Five. 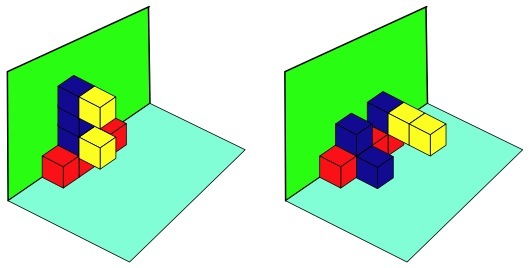 You have interlocking cubes of three different colours - 2 of one colour, 3 of another colour and 4 of the third colour. This is slightly different from Two on Five but is seen as an extension for some pupils. You might like to go there first! The nine cubes are to be connected in the usual way with the following rules being applied. See what others you can find. At some point ask yourself "I wonder what would happen if I ...?" Practical Activity. Working systematically. Compound transformations. Combinations. Interactivities. Investigations. Visualising. Interlocking cubes. Addition & subtraction. Cubes & cuboids.